Mondays can be a drag. Literally, we find it harder to drag ourselves out of bed and get back to the weekly grind. Start off your week, today, by releasing those ‘feel good’ endorphins and get your body energized and sweaty. There is almost nothing better you can do for yourself, then to get a workout in on a Monday. It sets a great example and pace for the rest of the week. 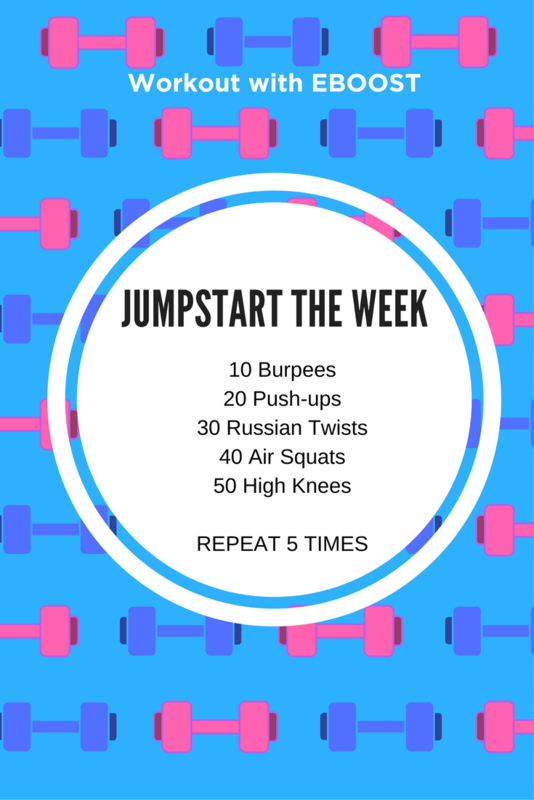 Start your week this week out with a bang and get sweaty with our workout. This easy-to-follow routine is perfect to get going for some Monday Motivation and get you on the right track for the rest of the week. We’re going to begin with 10 burpees. Next, 20 push-ups. 30 russian twists, then 40 air squats. Finally, 50 high knees! Repeat 5 times and you’ll start your week off feeling fit!